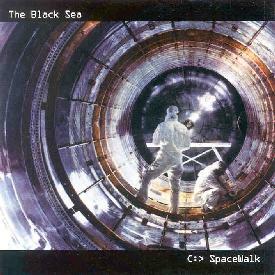 The Black Sea - "c:>Spacewalk"
The Black Sea is Zero Scratch and David Weintraub. As the name suggests, this is deep, deep space music. Mostly electronic, with some guitar as well, pieces range in style from the sinister opening track, Dub Star, to the more melodic Life Among the Stars Parts 1 and 2, to the almost jazzy Stages. Voice samples enhance the music throughout, clips from NASA transmissions and science fiction movies. This reminded of the kind of electronic music that was being produced in the 80’s: composed and focused. It was the kind of thing that electronic musicians were doing in those clean, newly digital days, after the era of the freeform analog explorers of the 70’s, but before techno turned everything into frantic dance music. The final track on this album, though, Home From the Hill, is reminiscent of the alien feel of very early Tangerine Dream. Not to say that this is like the new age music of the 80’s. This isn’t terminally laid back, wishy-washy synth music. It’s rhythmic and melodic, sometimes dark and cool as the farthest reaches of space, sometimes bright and shimmering, like the light of a new star. The Black Sea can be contacted via snail mail, care of: KLM, 420 Jericho Turnpike, Suite 213, Jericho, NY 11753.